In the first evening everybody introduced themselves and told about their own fishing interests. 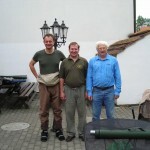 Milan also gave a lecture about fishing in Czech, fishing licenses and the status of the fish populations. The actual course began the next day when Jiri held his comprehensive lecture. Jiri talked about equipment, flies, leaders, tactics, moving and also technique and controlling the flies. At right in the beginning we were told that this course was just a start and that everybody will eventually find their own way of fishing. In my opinion Jiri’s technique differs a bit from what is commonly understood by Czech nymphing (in Finland). Jiri always holds some of flyline on the water and sometimes he fishes from quite a distance. Jiri also uses relatively short rods. A general advise was to keep the equipment in balance and to use some time for thinking process. 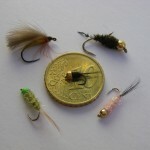 The most important features of the fly are the right weight and size. They said that fish do not like too heavy flies. According to Jiri, the actual pattern is not so important. He thinks that the most important thing in fishing is the ability to read water. However, this is something that cannot really be taught, it is something that develops by time and practice. For once there was a lecture where I didn’t feel sleepy even once! After the lecture we tied some flies according to Jiri’s guidance. Later Jiri also gave a demonstration at the river about his technique in practice. There he fished in different ways and at the same time he was telling us what he was doing and why. The next three days Jiri was fishing among the students teaching every student personally. For a while I fished with Jiri at the wide part of the river Vltava. The current was strong and steady there. Maybe the place was chosen because it was easy to give personal guiding to the students there. Before fishing I made my leader according to Jiri’s instructions, and it felt really short considering the current and the depth of the river. If not counting only few accidentally caught fish, I caught nothing. However, the canoos floating past in the river brought their own little nice addition. In Czech canooing is very very very amazingly popular hobby. During one week I saw at least thousands of canoos. Every available piece of land at the Vlatava river banks were filled with tents of canooing people. Because of this, the fishing was being tried to schedule in a way that the canoos would disturb us as little as possible. For the first time in my life there were canoos floating down the river on both sides of me when I was fishing in the middle of the river. Every paddler was not that skillfull or maybe they had had some ”joy-juice”. In any case they were happy people with whom it was nice to change greetings, although we didn’t understand each other. At one small and shallow creek I had an opportunity to see some big graylings but they couldn’t have cared less about my flies. Fishing was again nice sneaking upstream there. I used very small flies and the thinnest tippet I had. The fish I caught were small but I lost one really nice trout. It was interesting to see how well small graylings disappeared in to the really shallow water. 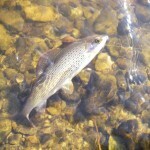 I was fishing a small stream where the current was slow and where the bottom was relatively flat. The bottom was mainly gravel. 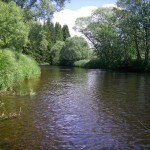 I was fishing with very fine tippets and small flies. Even I could easily see the bottom, I couldn’t know if there were any fish or not. At one river a big fish was smashing small fish into the air a few times. For a while I was swearing because I had only nymphs and dries with me. The river was relatively flat but it had a fairly temperate current. I couldn’t see any big stones. On the way to this place there lives a dog, which Karel has written about. I heard that if you drive too fast the dog will bite cars tires. Me and one Canadian guy were trying to get Karel speeding but this time Karel wanted to spare his tires. 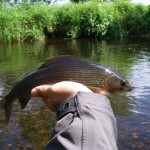 From the river I got small graylings and one grayling which was slightly less than 40 centimeters. When I was walking back to the meeting point a small deer scared me. I was really close to the deer when it started jumping away. It couldn’t just run because the grass was so high. It was a funny looking thing and it made me smile. Later Milan told that the big smashing fish was probably an asp. In the beginning I was catching a lot of small trouts. Some times I made several casts so that I always had at least some contact to fish. 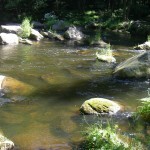 However, the nature of the river changed distinctively down stream. It became wider and it was more calm. There were fewer fish but they were graylings and they were nicer. This was exactly what I hoped for and Karel knew this. He wanted to make sure that I didn’t get stuck with the small trouts. During the course I caught rainbows, trouts, graylings and chubs. I also got some roach-looking fish, which I didn’t recognize. I have started my fly fishing by fishing chubs and I still fish them actively. That is the reason why I was thinking “what goes around comes around” when I was smiling and releasing my first chub in Czech. I had aftma 4 rods with me and in my opinion there is no point using heavier rods. The fishing would probably be nicest with aftma 2 rod, which is now at my wish list. 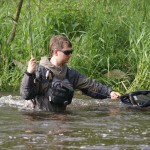 Jiri uses aftma 2 rod and floating DT line. During the course I used tippets between 0.14 mm and 0.08 mm. In some places it didn’t pay of to use tippet thicker than 0.10 mm. Although the tippets sound really thin, they didn’t feel like it. The fish were often small and normally the flies were small, too. Besides, a good quality monofil line is surprisingly strong when the knots are good and well tied. The flies I used were beadheads, the largest were tied to a 10 size hook and the smallest ones to size 20. The colors varied also a lot. In addition, some of the flies were light and some were very heavy. So the range of the flies was quite broad. Jiri is the central character in advertising the course but Milan’s participation should not be underestimated. Milan showed several nice demonstrations about different techniques. I don’t know if it was a coincidence, but every time when I saw Milan’s demonstration he caught a lot of fish. Although, according to Milan, not all of his demonstrations were that successful. In any case at least I was impressed about his fishing. Although Czech nymphing was the ground of the course, they didn’t try to claim that one technique was better or more correct than the other ones. 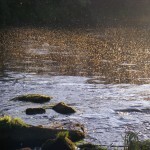 For example, they introduced also dry fly and pupa fishing. Both Jiri and Milan said many times that eventually everybody will learn a technique that suits them best. Jiri also said that a good (competing) fisher must be versatile, and they have to know many different techniques. I didn’t fly to Czech just because of a fishing course, it was also a fishing holiday for me. Fishing was easy because eating, accommodation, fishing places, time schedule and guiding were all well organized. This is the reason why I don’t have any accurate memories about the names of the places where I fished. I just didn’t care and I didn’t have to care. I jumped into the car, which was pointed to me and just saw where it took me. I was fishing at least at Vltava and Malse rivers and maybe somewhere else, too. Although it was a fly fishing course there was still enough time to fish in your own privacy. There was also plenty of fishing and it was well scheduled. I have sometimes a bad habit to spend too much time at the river and therefore I do not rest enough. Now the balance between fishing and resting was just perfect. The course is organized also year 2010. If you are interested in the possible course in 2011, there is information about the courses at Karel’s website www.czechnymphs.com. From the website you can see the program for the course 2010. 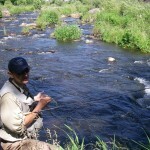 Doctor Karel Krivanec started fly fishing competitions tens of years ago. His best achievement is second place in the first championships in Czechoslovakia. Five times he has been in the qualifications for the national team. Karel is very strongly involved in different organizations activities; besides Czech competitions he has been organizing also international competitions. He has also been the manager of Czech national team, the president of Czech fishing committee and for 12 years the manager of South Bohemian fishing region. The most famous achievement is perhaps his the classic book “Czech Nymph and Other Related Fly Fishing Methods”. Karel has also written many articles for fishing magazines and he has been fishing around the world. Karel was the head of a laboratory, which was doing research on parasites and fungal infections. Nowadays he is retired. Milan Hladik is a doctor of hydrobiology. He wrote his Ph.D. thesis about fish migration between reservoirs and rivers. His current work is related to improving water ecosystems. This involves revitalization of rivers, building of fish passages and improving of natural habitats. 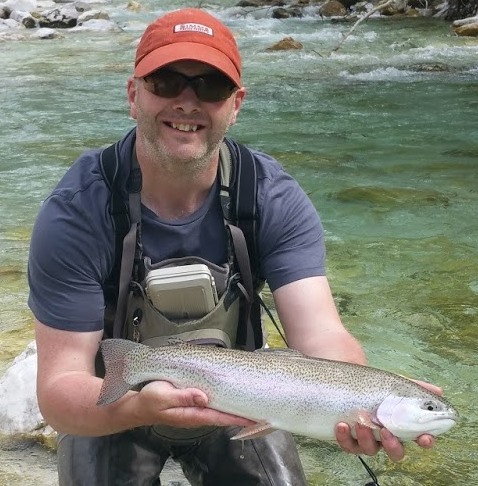 As a part-time job Milan continues the work Karel started as the manager of the South Bohemian fishing region, trying to promote the modern attitude towards sport fishing. The last 15 years Milan has been practising fly fishing very actively. His fly fishing is very versatile. Milan has been fishing and competing in many European countries. He has also been organizing the yearly Hanak Open fly fishing competition. Milan likes to take photographs and he has taken photos for Karel’s book. 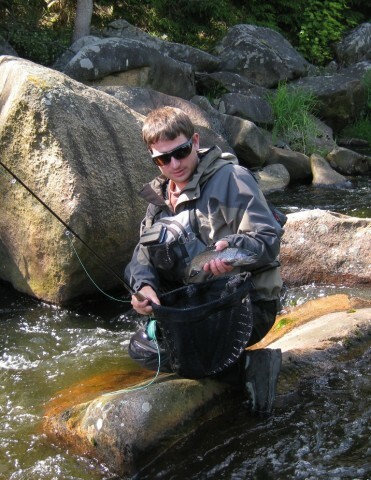 In addition, Milan writes articles about fish ecology and fly fishing regularly for Czech fishing magazines. Jiri Klima has been the coach and captain of the Czech national team between 1993 and 2008. During that time their team has won 5 gold medals, 3 silver medals and 2 bronze medals in the world championships. In the European championships they got one medal of each color. In addition they have won individual medals, 4 gold, one silver and 5 bronze. Jiri has also been awarded as the best Czechoslovakian flytier. He has patented many fly fishing innovations like weighted hooks.